In Guild Wars 2‘s upcoming Heart of Thorns expansion, the team at ArenaNet is looking to expand on their existing class system with the introduction of elite specializations. Elite specializations come as a part of the game’s recently revamped trait system, and will allow players to choose an entirely new trait line as one of their three active trait lines, gaining access to a weapon previously unusable by their profession, new traits, new utility skills (including healing and elite), and a new twist on their class’s profession mechanic. Many of the skills being added draw their functionality from new skill technology being introduced with the expansion, so even seasoned players should find something new to play around with. Despite the name, elite specializations aren’t meant to be a straight upgrade on the base class; the goal is instead to offer a compelling new play style that was previously unavailable, as well as introducing a new system for ArenaNet to continue to use to expand the existing classes further down the road. Please keep in mind that these specializations are still in development – there have already been many changes since their announcement, and will likely be more before the launch of Heart of Thorns on October 23rd. For the most up to date information, please check for developer discussions going on in each class’ subforum on the official forums (with this constant state of change in mind, this article will focus more on the design behind the specializations, and not player reception and/or balance). Now without further ado – here are the elite specializations being introduced in Guild Wars 2: Heart of Thorns. 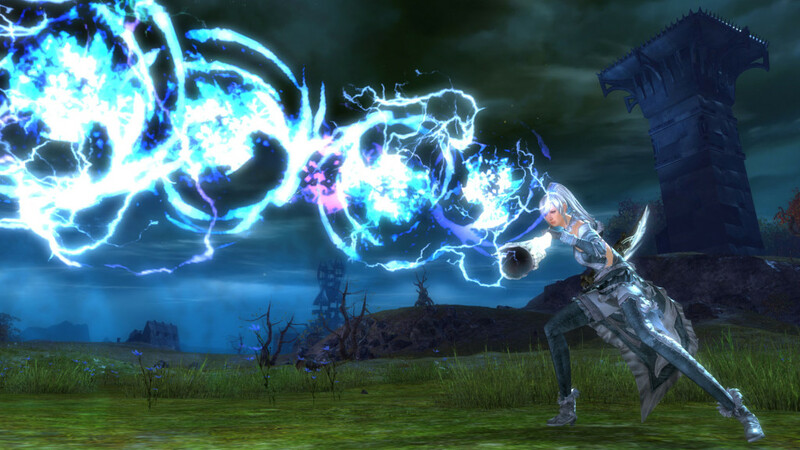 The Tempest brings a close range focus to the Elementalist specialization, offering new ways for the class to provide damage and support from the front of the fight. With the design of this elite specialization, we’re aiming to add a more direct frontline support option that rewards precise positioning and the ability to turn a fight with sound decision making and deft blows. While the base Elementalist class thrives on rotations which quickly cycle through its elemental attunements, the Tempest aims to reward players for spending time in them by offering them powerful overload abilities that can only be activated after spending some time in an attunement. These overloads take the form of point-blank area-of-effect abilities channeled around the caster which will damage, heal, and apply other effects around the caster depending on the element being overloaded, and though there will be significant risk involved when attempting to complete an overload’s cast, a big reward is promised when successful. 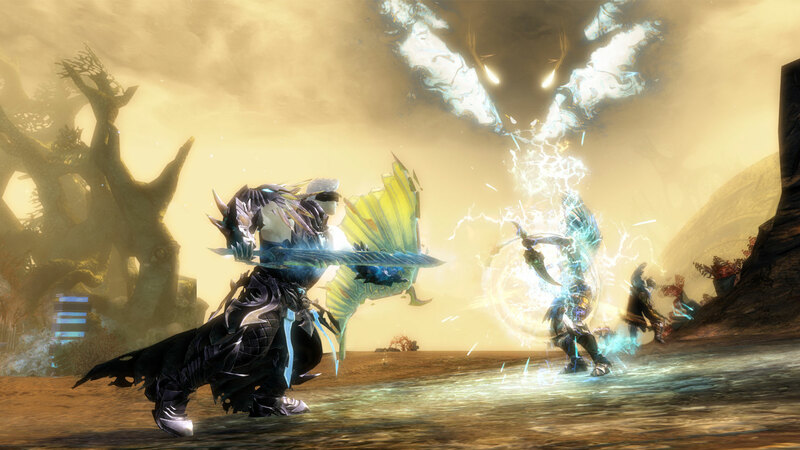 The Tempest gains access to the warhorn weapon type, gaining new damaging and supportive abilities to make use of. While in water attunement, you’ll be able to unleash a moving water field that heals allies. Air attunement’s cyclone will pull enemies to a point, while its lightning orb will fire projectiles at all enemies within its path. Along with these and other skills, using a warhorn will also unlock the elementalist’s latent potential to share boons and extend their durations among allies. Finally, the Tempest specialization will unlock shouts as utility skills, further bolstering the players’ point-blank area-of-effect arsenal with effects ranging in variety from burns or chills on enemies, to stun breaks and superspeed for allies. Read more about the Tempest on the official reveal post. The Engineer receives the Scrapper elite specialization, gaining a melee weapon and drones! This mechanical master brings damage and disruption to the profession through a variety of ingenious inventions and electrifying abilities. The Scrapper’s weapon of choice is the Hammer, a hard hitting, surprisingly versatile weapon with everything from an explosive auto-attack chain granting might and applying vulnerability, to a projectile reflect, to a lightning field that stuns enemies, to a three-part leap attack that keeps the Scrapper on their target. 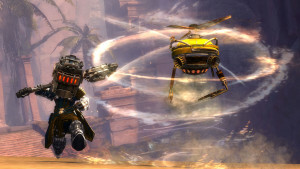 Drones, known as gyros in Tyria, make two appearances in the Scrapper’s toolkit – as both the profession mechanic and its utility skills. As the profession mechanic, Scrappers will be able to rally downed allies and execute downed enemies from range via sending over a gyro, and while these gyros can be targeted and interrupted, it’s also possible to trait them for stability to give them a further edge. These tiny machines have been crafted with specialised purposes. Each gyro model has a limited amount of fuel before it detonates or is destroyed in a hail of dazing sparks. If traited, they’ll explode in a larger area while stunning foes. As utility skills, gyros can fill a variety of roles, ranging from clearing conditions on allied players to the elite skill, which provides stealth to nearby allies (though the gyro itself remains visible). As with the Engineer’s other utility skills, these gyros grant tool belt skills as well; for example, the elite skill which provides stealth also provides a toolbelt skill to detect stealthed targets in a large area. Read more about the Scrapper on the official reveal post. With the Dragonhunter comes the addition of long ranged combat to the Guardian class, bringing with it a focus on more engaging virtue use and the thematic role of a hunter. Instead of fire-and-forget, we’ll be introducing more focused abilities that allow you to lend a better helping hand around the battlefield; virtues will become corporeal and will require you to aim them to some extent. When playing with the Dragonhunter specialization, the active uses of Guardian virtues will shift to new, more active forms than their original iterations. Activating Virtue of Justice will result in a spear thrown to the Dragonhunter’s target, tethering to it and all enemies it pierces and continuously burning them. Virtue of Resolve’s active effect will cause the Dragonhunter to leap across the battlefield on silvery wings, landing to deliver a powerful heal to themselves and nearby allies. Virtue of Courage will create a shield in front of the Dragonhunter that will move with the player, blocking all attacks within the radius, but leaving the Dragonhunter himself vulnerable from behind. To facilitate the long-ranged playstyle, the Dragonhunter specialization will unlock the use of the Longbow, a damage-oriented weapon with some supportive and control abilities as well, allowing the player to support his allies from within the back lines. Finally, playing into the theme of the hunter, Dragonhunters will be receiving traps as their new utility skills. These come with a variety of different effects, from dispersing shards on the ground that will grant aegis to allies when walked over, to an area-of-effect skill revealing stealthed enemies and applying a heavy amount of vulnerability. Read more about the Dragonhunter on the official reveal post. As the name implies, the Chronomnancer is Guild Wars 2‘s take on a time mage, and brings to the Mesmer an exciting amount of time-themed utilities. Our chronomancer does much more than distribute speed to allies while slowing down enemies. This specialization also gives players the ability to stop and even revert time through use of their abilities. The Chronomancer gains exclusive access to a new buff called alacrity, which functions as the opposite of chill by speeding up the rate at which allied players’ abilities recharge. One announced trait would make shattering the Chronomancer’s illusions grant themselves alacrity, making alacrity uptime an important status effect management tool for the specialization. One such skill, called Tides of Time, launches a wall of compressed temporal energy from the chronomancer’s shield that travels forward a moderate distance, absorbing all projectiles that are fired into it. If the wall passes through an enemy, that enemy becomes frozen in time and stunned for a short duration, while allies touched by the wall are granted a short burst of quickness. When the wall reaches its maximum distance, it turns around and rewinds itself back toward the chronomancer, applying all its effects on targets in its path a second time. An adept chronomancer can even reposition while the wave is moving, to change the returning trajectory of the wall. If you’re able to pass through the wall on its return trip, it refunds a portion of the recharge so you can use it again sooner! 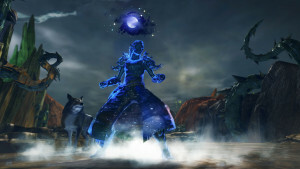 The specialization will also unlock wells as its utility skill, a type of delayed-reaction large ground-targeted AoE utility previously only available to necromancers. The Chronomancer’s wells will function significantly differently though, placing a large clock-face graphic on the ground that will tick down before unleashing its final offensive or defensive effect. The most exciting skill in the Chronomancer’s arsenal is still by far its new profession mechanic, Continuum Split, which will allow the player to shatter their illusions to gain a set amount of time wherein all actions affecting their character will be reverted when using the follow-up skill, Continuum Shift. When used, the follow-up skill reverts the Chronomancer back to their previous location, health and endurance levels, and cooldowns. This skill essentially gives the chronomancer a reset button and allows for tricks such as casting any skill twice, avoiding a killing blow, or simply tactically repositioning yourself. Remember Tides of Time from earlier in this article? Skillful use of Continuum Split will allow you to catch two returning time waves, doubling the effectiveness of the recharge bonus while gaining twice the benefits. Read more about the Chronomancer on the official reveal post. The Reaper specialization draws its thematic roots from the slow moving but relentless horror villains of cinematic fame, bringing with it chills to keep its foes nearby and powerful melee cleave abilities previously unavailable to the Necromancer class. The greatsword is the ideal weapon for expressing this sense of dread due to its size and weight, but there was one thing that was missing—what’s a reaper without a scythe? Necromancers specialized as Reapers gain access to the greatsword as their specialization weapon, gaining access to low attack speed, but devastating attacks to any enemies unfortunate enough to be nearby. A core skill of the Reaper’s greatsword is Gravedigger, a heavy hitting point-blank area-of-effect skill that has its cooldown reset if any of the enemies hit are below 50% health. 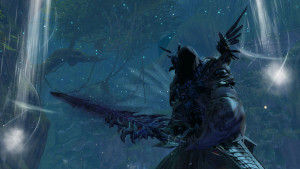 The Reaper’s death shroud is completely reworked from the Necromancer’s, offering higher mobility and sweeping, massive, melee area-of-effect attacks with the Reaper’s enormous scythe. For its utilities, the Reaper gains access to a line of offensive shout skills that gain in power when the player is in the thick of the fight. All of these shout skills act as attacks that can hit up to five enemies and scale in effectiveness based on the number of targets struck (and yes, you read that right—reaper shouts deal damage!). In this way, the reaper is rewarded for diving into the thick of battle to engage as many foes as possible. Reaper shouts differ from warrior and guardian shouts in that they focus more on harming foes than they do on bolstering allies. Read more about the Reaper on the official reveal post. With the Druid comes the introduction of the game’s most powerful healer, a niche the folks at ArenaNet are adamant will be in high demand in the new content being added with Heart of Thorns. As a longtime ally of nature, the ranger can now channel the strength of Tyria itself after tapping into the primal forces of the Maguuma jungle. The Druid brings the staff to the ranger, acting as a caster to damage enemies and heal allies with its support oriented skill-set. Featuring an auto-attack laser that heals allies who pass through it as well as a wall that converts projectiles into heals, the staff abilities come with a heavy emphasis on positioning to get the most out of every attack. Players choosing to specialize as Druids will gain access to a new profession mechanic similar to the Necromancer’s Death Shroud, wherein the Druid charges a bar to power a new form, granting access to powerful new healing abilities while toggled on or until the bar has been depleted. Avatar skills are on very short cooldowns and transform the ranger into a healing powerhouse, pushing the upper bounds of sustainability and recovery; in celestial avatar form, a druid becomes capable of bringing a party on the brink of death back to pristine condition. For its utility skills, the Druid is gaining access to glyphs, which, similarly to their incarnation on the Elementalist class, will change slightly in purpose depending on whether or not the Druid is in their base form of the new avatar state. In general, these glyphs change from being offensive or selfish to more support oriented when the avatar form is toggled on. For example, Glyph of Equality, which dazes foes near the caster normally, will change to a stun break for allies when transformed. The Druid’s elite glyph brings with it a new functionality to the game, allowing the Druid to tether themselves to nearby enemies, dealing all damage they receive during the skill’s duration to the foes to whom they are tethered. 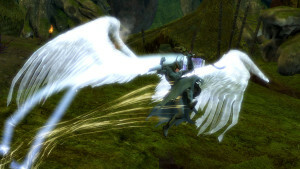 In the avatar form, the skill changes to tether instead to nearby allies, sharing all healing received with allies instead of damage. Upon entering the lush Maguuma jungle, you’ll encounter many new creatures. Some are fierce, some are friendly, a few are both…and among them are new potential pets for all rangers! In addition to the Druid specialization, all Rangers will be gaining access to new pets as a part of the Heart of Thorns expansion, with a selection ranging from tigers to fire-breathing wyverns. Read more about the Druid on the official reveal post. Thieves who choose to take on the Daredevil specialization will gain access to a high mobility, evasive, staff wielding, melee fighter with power area-of-effect skills while also retaining significant single-target potential. The daredevil will wield a staff, use physical skills, and take advantage of unique dodge-roll abilities against the legions of Mordremoth. The Daredevil takes evasion to the next level, gaining access to a third bar of endurance with which to power their dodges. Additionally, the Daredevil’s dodges will be replaced with one of three new effects, as chosen via the trait line’s grandmaster trait. Lotus Training – Throw daggers while dodging to apply bleed, torment, and cripple to enemies. Bounding Dodger – Deal crushing damage at landing location while functioning as a leap finisher. Unhindered Combatant – Dodge is a dash forward with increased travel distance, removing cripple and chill effects. The Daredevil’s specialization weapon, the staff, continues with the mobility oriented theme, including several abilities from dashes forward, rolls backward, and a heavy hitting leap. While wielding a staff, you’ll remain elusive while gaining access to regular area-of-effect melee damage. You’ll be able to make frequent use of weakness and blindness in addition to having evasion available to keep you mobile on the battlefield. 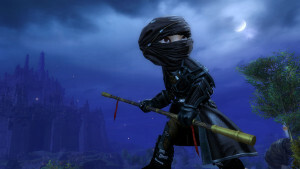 Also being introduced to the Thief class with the specialization is the physical category of utility skills – single-target attacks with a focus on singling out and disabling weakened enemies. This includes the first skill-based finishing move, as the final portion of the Daredevil’s elite skill will instantly finish any downed enemies it strikes. Read more about the Daredevil on the official reveal post. Heart of Thorns is bringing the Beserker specialization to the Warrior profession, a new twist on the physical fighter that includes a lot more fire. 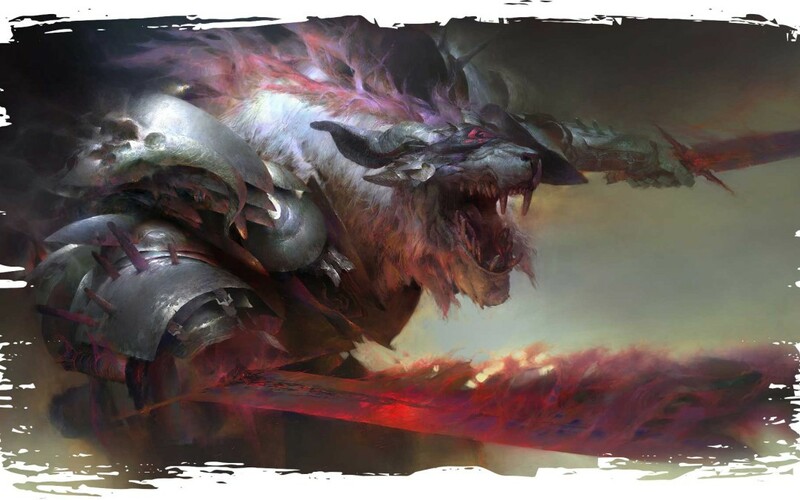 Berserkers are warriors that have tapped into a primal bloodlust to unleash their rage in the form of powerful new burst skills. The Berserker’s profession mechanic adds a new functionality to the Warrior’s adrenaline bar, transforming it to power the Berserker’s new primal burst skills, which inflict generally inflict additional effects in comparison to the vanilla burst skills. For example, instead of the mace skill Skull Crack, Berserkers will be able to use Skull Grinder, which still disrupts (for a shorter duration), but also applies multiple conditions to the affected target. The Berserker gains access to the off-hand torch weapon, putting it to a fully offensive new purpose by lighting the ground, or themselves, on fire. While the guardian uses magical flames for protection and purging, berserkers use the torch as a reckless weapon of destruction, slamming it into the ground and even lighting themselves ablaze to become mobile fire fields. 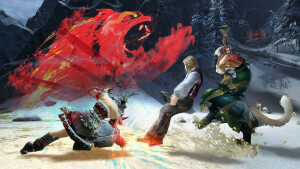 The specialization introduces rage skills as the new utility, all of which grant bonus adrenaline in addition to their unique effects to help the Berserker use its burst skills more often. One physical skill, Wild Blow, is a strike to an enemy so powerful that it turns their own body into a projectile that can be used to hit other enemies. Read more about the Berserker on the official reveal post. The Revenant is the new profession being added with the Heart of Thorns expansion, and will be receiving the Herald elite specialization alongside the existing classes. Revenants are heavily armored masters of the Mists with abilities that allow them to harness and manipulate energy in order to perform immense attacks. They invoke powers from legends of the past to dominate foes. The Revenant is able to equip two legends at a time, determining its utility skills, and can swap between those legends in a method similar to a weapon swap. While this does grant the Revenant access to two heal skills and two elite skills, these utilities are limited by access to the Revenant’s class resource, energy, which regenerates over time. Read more about the Revenant class on the official reveal post. The Herald introduces the Legendary Dragon Glint as an additional legend for the Revenant to channel, bringing utility skills called facets that function as powerful auras by pulsing boons to nearby allies, at a continual cost of energy while toggled on. All five skills on the right half of the bar are upkeep skills, as is the added second profession mechanic skill, Facet of Nature, which I’ll explain below. When activated, each facet pulses beneficial effects to nearby allies as long as it’s active. While a facet is active, you’ll gain access to a new skill that you can use to consume the energy of that facet for a more potent skill at the cost of setting both on recharge. The added profession mechanic, Facet of Nature, increases the duration of all outgoing boons for affected allies, including the Herald themselves. When its flip-skill is activated to consume the facet’s energy, it provides a burst of all the boons the other active facets are providing for a short term power boost. As facets rely on the Herald being in the fight to provide their benefit, the elite specialization gains access to the shield as its weapon, gaining skills to boost the Revenant’s survivability on the front lines. The first, Envoy of Exuberance, sends a wave of energy to a ground-targeted location, providing protection to allies, bursting to heal when it reaches its destination, before returning to the caster. The second, Crystal Hibernation, focuses more on personal protection than support, granting the Herald rapid health regeneration while making them immune to damage and conditions. While active, this skill grants the Herald a defiance bar, which can be broken with the application of multiple crowd controlling effects to end the skill early. Read more about the Herald specialization on the official reveal post. A lover of social gaming and virtual worlds, Ethan hails from a land flowing with craft beer and free-range chickens - Portland, OR. Best known for his work at Tamriel Foundry, MMOGames, and The Errant Penman, he continues his search for a new MMO home as the Hobo Gamer to this day. Find more of Ethan's work at The Errant Penman.